Lifestyle factors, such as your eating habits, drinking habits, sleep pattern, hygiene habits and exercise routine, have a direct impact on how your skin looks. In particular, the food you eat and the nutrition that your body gets (or doesn’t get) from your diet will be reflected in your facial skin. So, if you wish to rock a glowing, radiant skin that can make you stand out in a crowd, you can include a powerful juice in your daily diet. You just need some readily available ingredients and a juicer or food processor to make it. 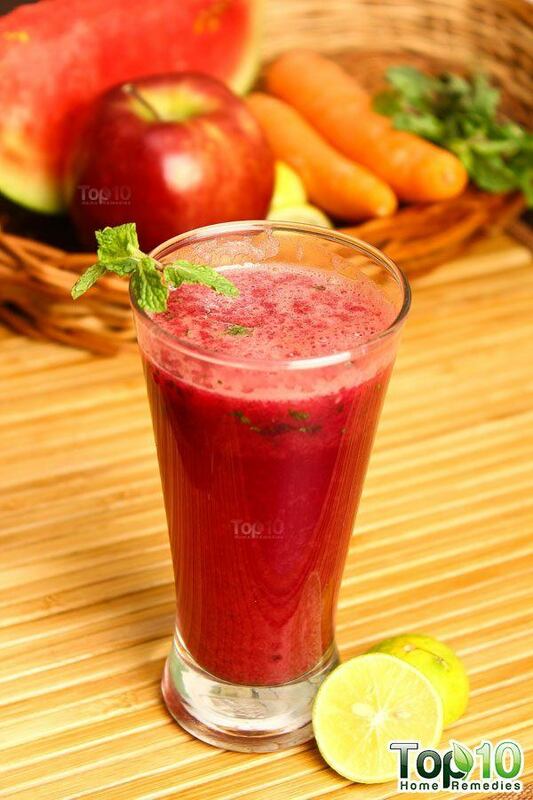 This powerful juice recipe includes a variety of healthy fruits and vegetables. For best results, make sure you opt for organic produce. 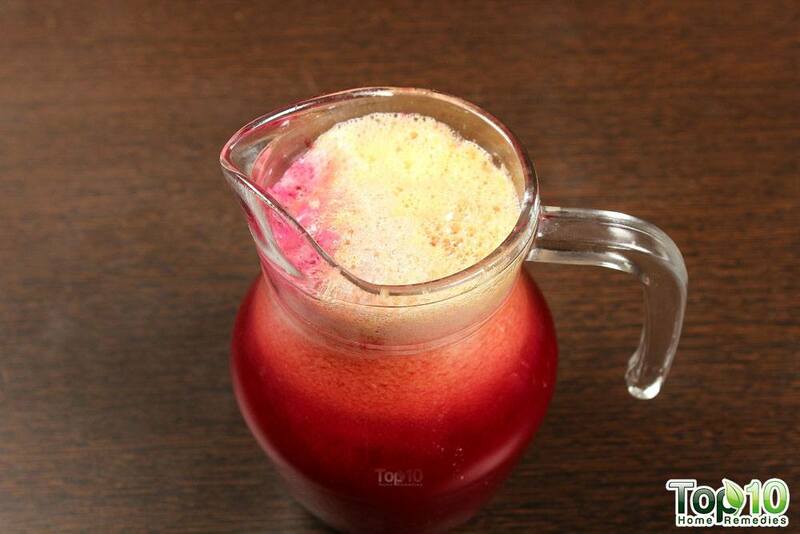 Beetroot: Being rich in antioxidants, it protects the skin from premature aging signs by neutralizing free radicals. Plus, it aids in detoxification and helps purify your blood, which in turn gives a healthy glow to the skin. Carrot: The high vitamin A and other antioxidants in carrots keep your skin healthy, vibrant and glowing. They even protect your skin from the damage caused by the sun’s harmful ultraviolet (UV) rays. Cucumber: This water-rich fruit keeps the skin hydrated. Also, the trace mineral silica in cucumbers rejuvenates skin and helps maintain elasticity. Apple: Being rich in vitamins A, B and C, as well as beta-carotene and antioxidants, apples help maintain healthy and younger-looking skin. Pomegranate: The vitamin C in pomegranates promotes collagen formation, which helps delay skin sagging and wrinkling. Orange and lemon: The strong anti-inflammatory and antioxidant properties in oranges and lemons help fight signs of aging and prevent skin damage caused by exposure to the sun and environmental pollution. They even aid detoxification, which is important for clear and beautiful skin. Ginger: Rich in antioxidants, vitamins and minerals, ginger promotes a smooth and clear skin. It even aids in weight loss. 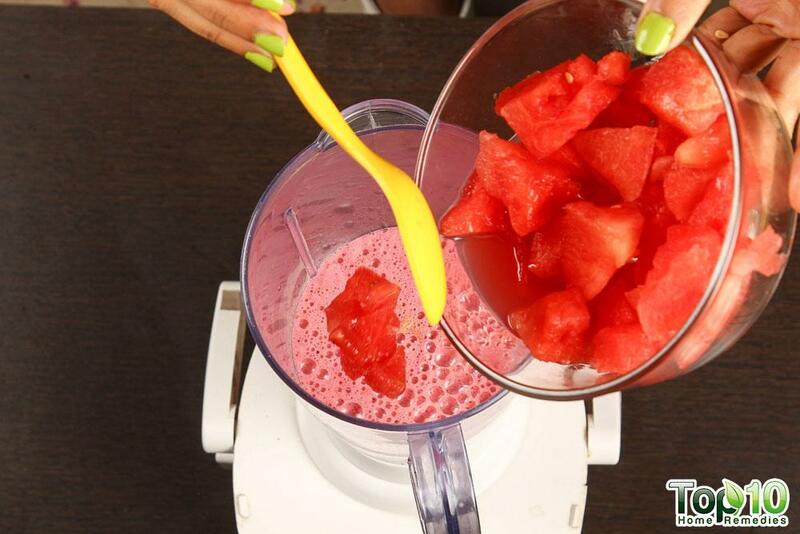 Watermelon: This summertime favorite has almost 92 percent water content that helps keep your body hydrated. 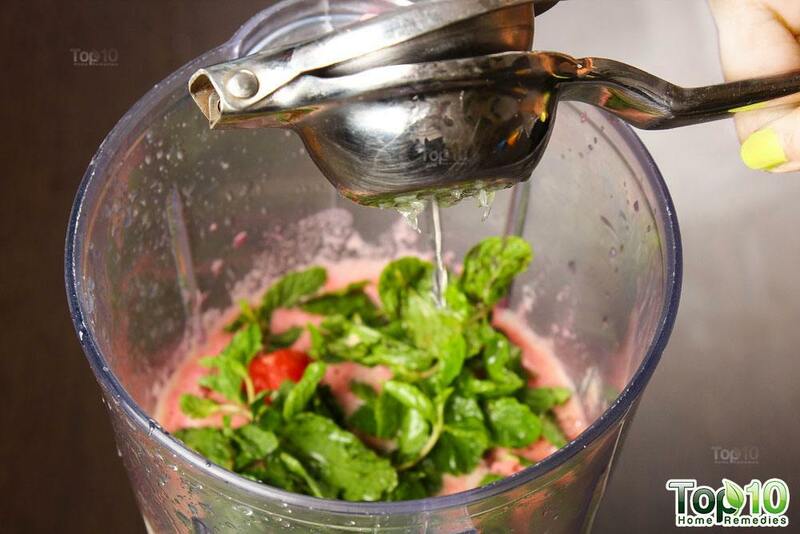 Plus, the compound lycopene in it neutralizes free radicals and protects the skin against UV light. 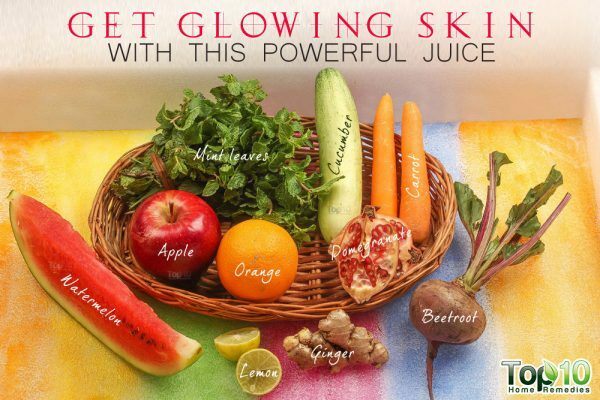 Here’s the recipe for a powerful juice that will give you glowing skin. 1. 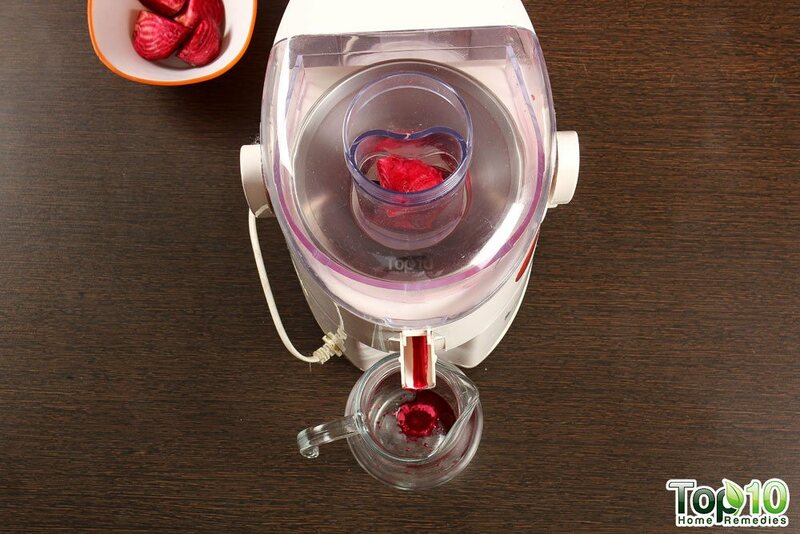 With a juicer, extract the juice of 1 large beetroot or 2 small beetroots (peeled and cut into pieces). 2. 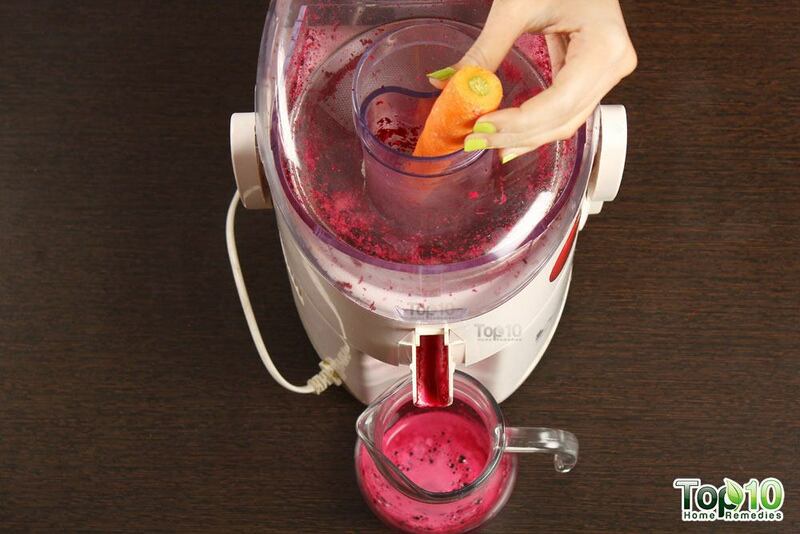 Next, put 2 small carrots (peeled) through the juicer. 3. Next, juice 1 cucumber (peeled). 4. Then, extract the juice of 1 large apple (cut into small pieces or slices). 5. 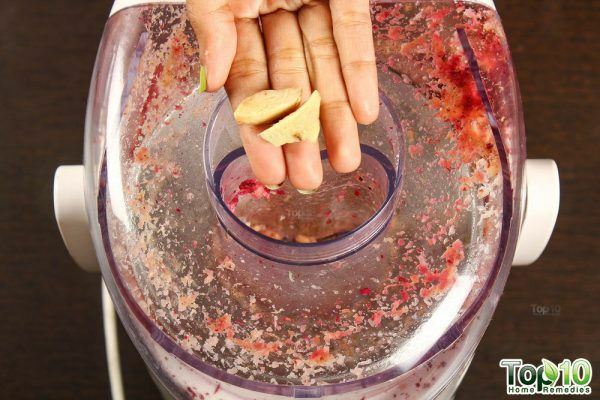 Next, put the arils of half a pomegranate through the juicer. 6. Now, extract the juice of a thumb-size piece of ginger root (skin removed). 7. 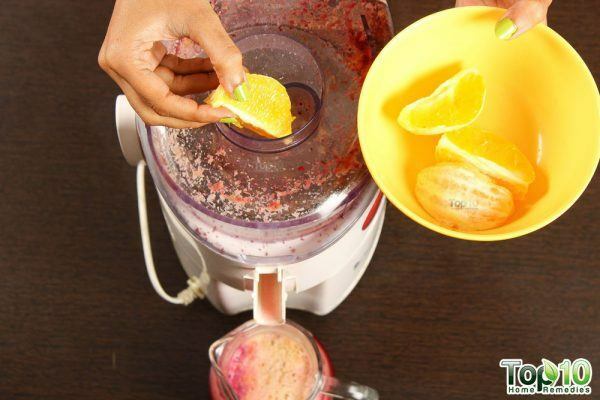 Finally, it’s time to put 1 large or 2 small oranges (peeled) through the juicer. 8. 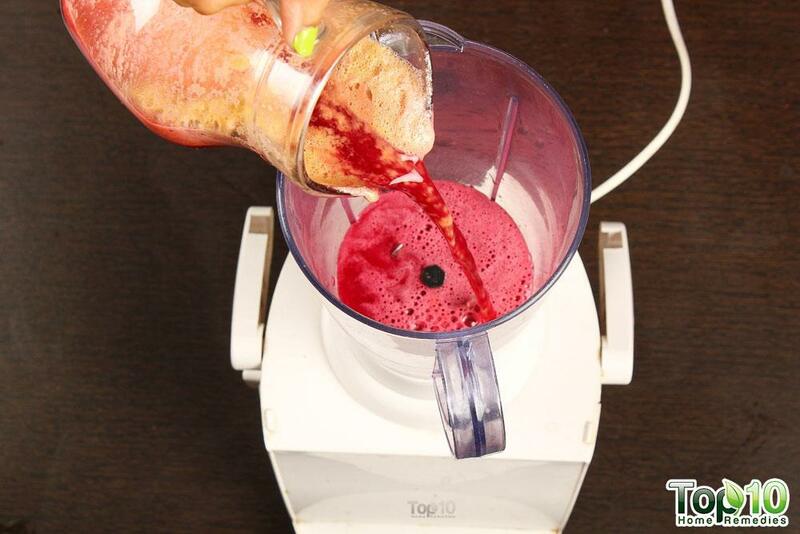 Pour the entire jug of mixed fruit juice into a blender. 9. Put ½ cup watermelon cubes (remove the black seeds) in the blender. 10. Add a handful of fresh mint leaves, too. 11. Next, add the juice of half a lemon. 12. 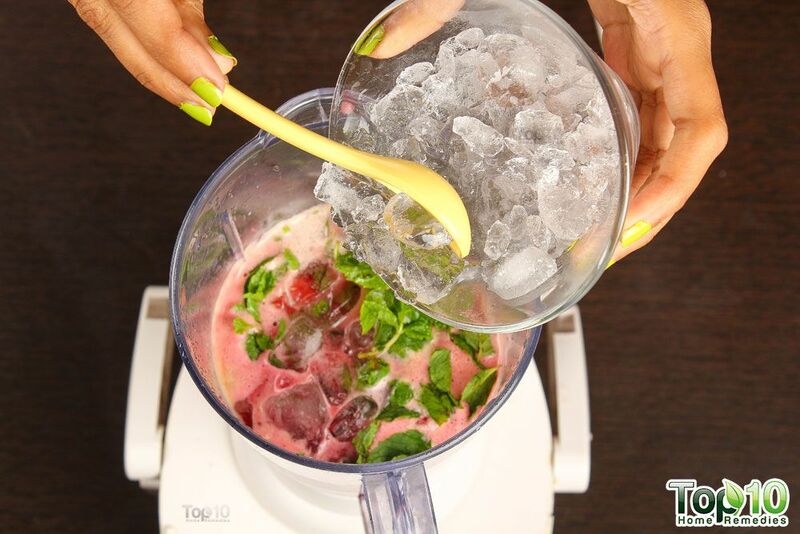 Finally, add some crushed ice to make the juice slushy. 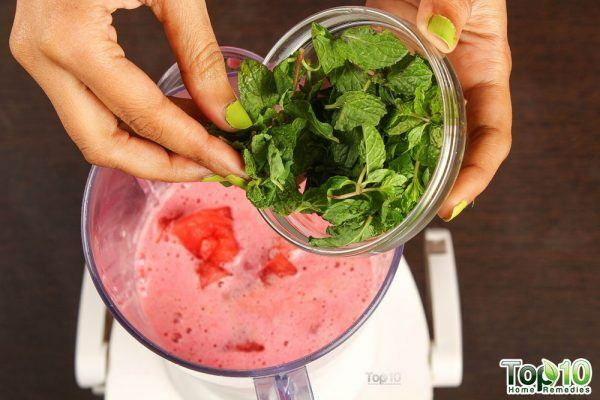 Blend the ingredients for a few seconds. At this point, you can add a little lemon juice and enjoy your freshly extracted juice, or continue with the remaining steps. 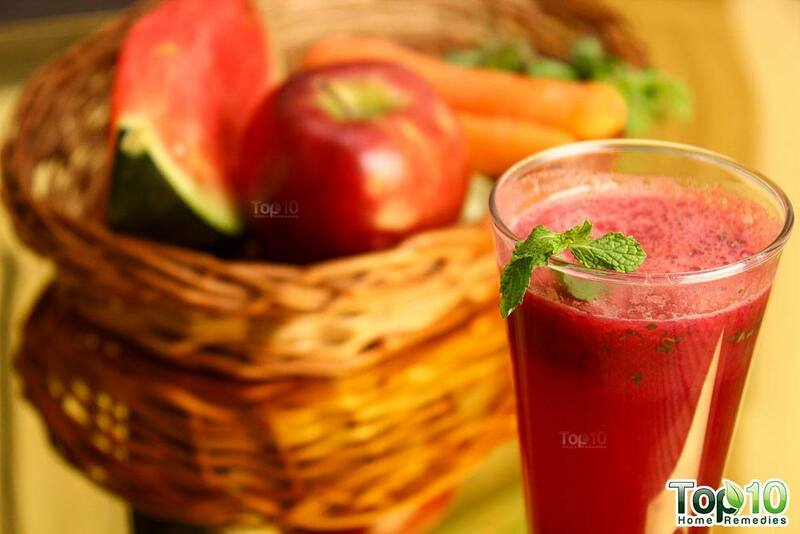 Transfer the juice to a glass and drink it daily to enjoy glowing and flawless skin. Always wash the fruits and vegetables thoroughly under running water to get rid of dirt and pesticides. You can add a little rock salt to the juice before drinking it to enhance the taste. You can omit some fruits from this recipe if the ingredients are not readily available in your market. Instead of mint leaves, you can try sweet basil leaves. 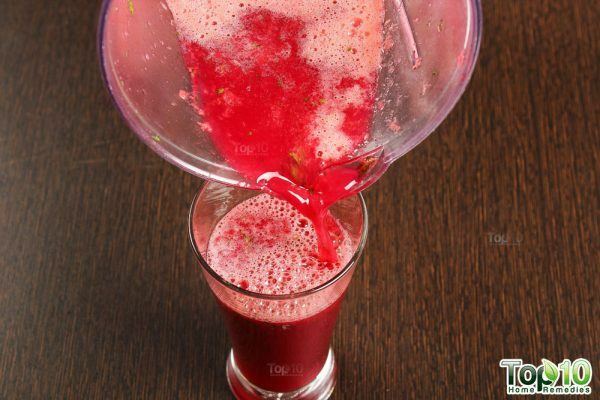 To make the juice more beneficial, you can opt to add 2 celery stalks. 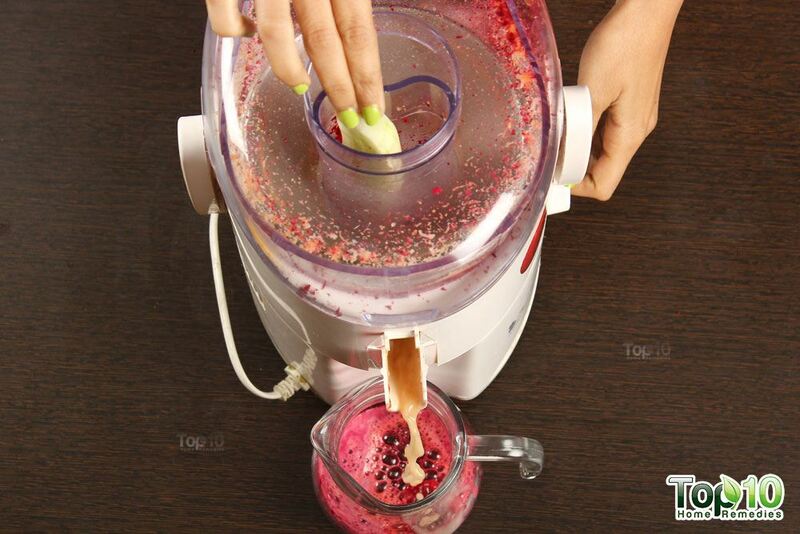 When peeling the beetroot, take precautions as the juice can stain your hands and countertop. Make sure to remove the seeds from the watermelon. 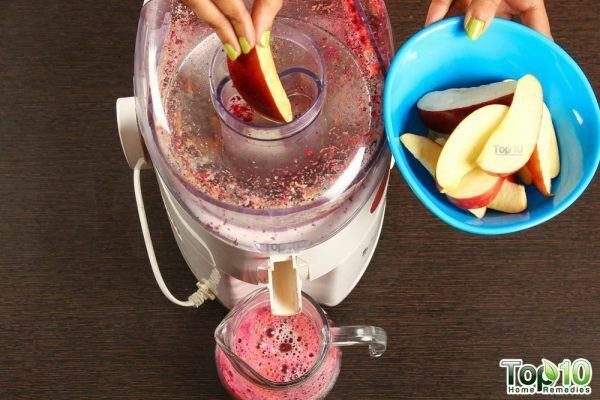 Drink your juice soon after making it. 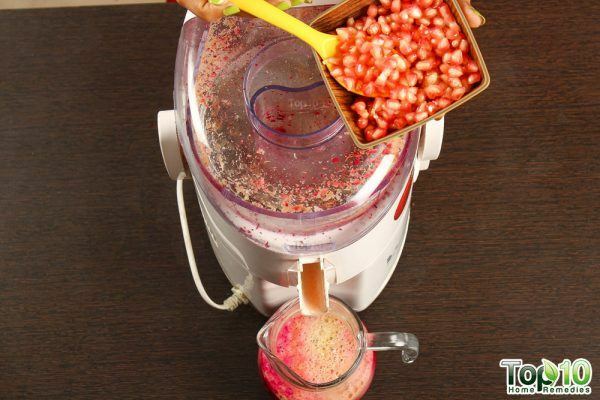 You can store the remaining juice in an airtight container in the refrigerator for a couple of days. That’s a smart way of looinkg at the world. I didn’t even know about this recipe, and we’ve been juicing something really similar. That’s Ironic. Cool!! Can I drink this juice while pregnant?